Here are 5 free online text analyzer to check readability of text. These website can analyze the articles or other text-based stuff you write. After analyzing the text with these websites, you will know the readability score in various standards and some other stats. Apart from the readability score, you will see general text analyzing details like number of words, sentences, the sentence having more than 20 words, inappropriate adverbs, common replaceable phrases, etc. All of these websites work very well when it comes to analyzing text for readability issues. Also, some of these websites have some advanced features like SEO content analysis which lets you optimize your article with SEO perspective. No matter what text-based content you write, whether it is a general article or blog post, its quality depends on its readability. So it’s a good idea to analyze the readability of your content before it reaches the user. And these websites will help you do that quickly. These websites will analyze the text and will suggest some changes. And finally, you will come up with an easily readable and quality post that you can publish. Do note that these websites are different from those which let you proofread your articles. These websites don’t fix grammatical mistakes or common typos. Textalyzer is one of the best free text analyzers to check readability of text. It lets you analyze a text having 2000 words without registration. If you have a long article, then you can sign up using your social media account. It performs a lot of tests to analyze the text you submit to it. It performs word count, syllable count, sentence count, unique words count, adverbs count, sentences having more than 20 words, cliche count, letter count, SMOG index, Flesch-Kincaid Grade Level, Flesch-Kincaid Readability Ease, automated readability index, and much more. In addition to these, there is SEO content analysis tool there. You can check whether your article is SEO optimized or not in just a few seconds. To analyze your content for readability using Textalyzer is fairly simple. You just have to copy-paste the text to its interface and then it will show you a detailed analysis result. It highlights various sentences with different colors and gives you suggestions. You can follow the suggestion and make changes in your article accordingly. You can see the readability score of your article on its interface on the top left side. Also, you can specify the title of your post and focus keyword and it will show you stats of your text based on SEO analysis. You can see the keyword density, density of unique words, title and content analysis, etc. After making the changes that it suggests, you are ready to post your article. 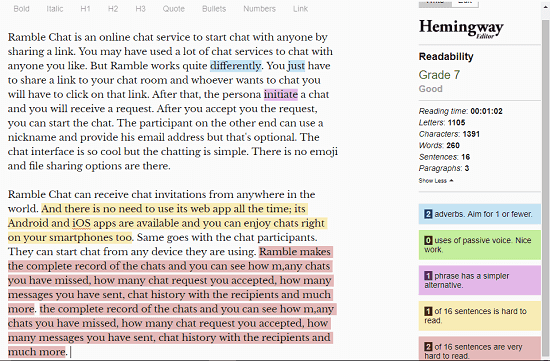 Hemingway App is a free text analyzer that you can use to make your article easily readable. It comes as a desktop software which is paid but its online editor is free. You can use that to check the readability of your article. Not only for checking your article for readability, but you can also use this to write your article from scratch. It gives a score to the text that you write in it or copy paste in it. Hemingway App is a simple text analyzer and has fewer number of text readability checker features. It shows you basic text analysis stats like number of words, letters, sentences, paragraphs etc. with the readability details like adverbs count, passive voice test, phrase simplification test, hard sentences etc. You can see the report on its interface and it highlights the sentence which you can improve. There is no prior registration or sign up process. You just get started on it as soon as you reach its homepage. Copy paste the text you want to analyze or you can simply start writing there. It has all the writing and formatting tools in it. After pasting the text into it, you will see the readability stats on the right side of its interface. Also, it highlights the text in the editor which it suggests you to optimize. So, you can optimize the text as it suggests and when the readability score is good then you are all set. Use the content as you wish. 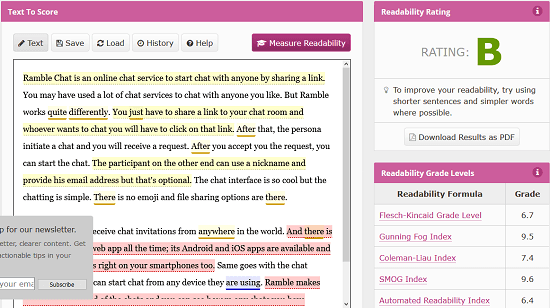 Read-Able is yet another free text analyzer to check reliability of text online. It is a fairly simple tool that can immediately tell you the readability status of your article you submit to it. It shows you the Flesch Kincaid Reading Ease, Flesch Kincaid Grade Level, Flesch Kincaid Reading Ease, Gunning Fog Score, Level, Gunning Fog Score, SMOG Index, Coleman Liau Index, No. of sentences, No. of words, No. of complex words, Percent of complex words, Average words per sentence, Average syllables per word, and some other parameters. Apart from copying paste a text, you can also check the readability of text from a web page through a URL. Submit the text you want to analyze to its interface after reaching its homepage. After that, it will show you the readability stats. You can analyze the readability status of your text and improve it. But, here it doesn’t suggest you the changes that you can make for your text to make it easily readable. The tool is simple and it is a good tool if you already know how to optimize an article if the readability score is less. 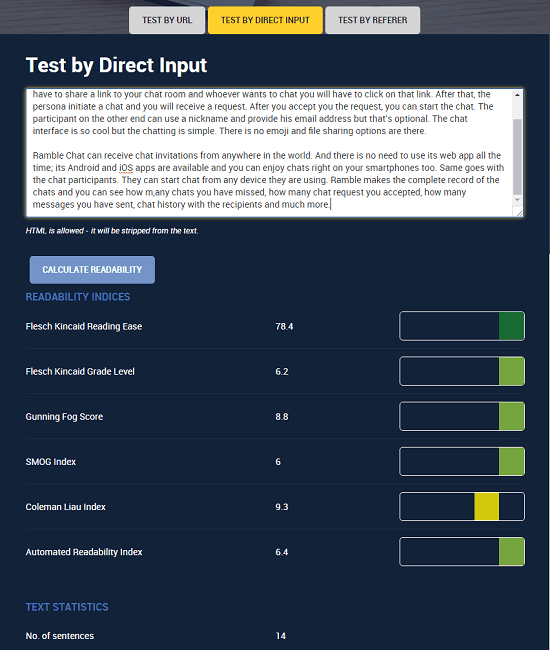 Readability Calculator by Online-Utility is yet another text analyzer to check readability of text. 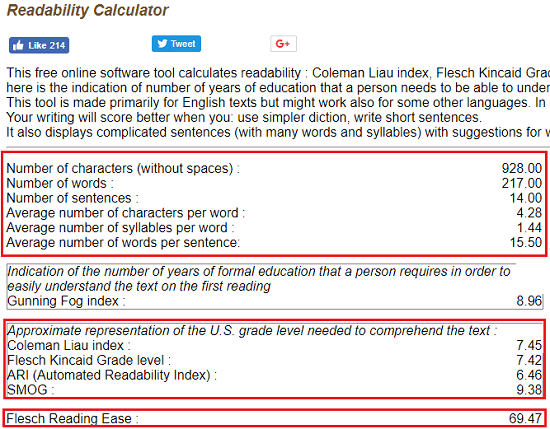 It is a simple readability calculator that can show you Coleman Liau index, Flesch Kincaid Grade level, ARI (Automated Readability Index), SMOG, and Flesch reading ease. You can analyze the readability score and make necessary changes if you want. On the website, you will see other tools that you can use to fix your article. The interface of the tool is pretty simple and it shows the readability result in a very simple way. Getting started with Readability Calculator is very simple as there is no prior registration or sign up process. After reaching the homepage of the tool, submit the text you want to analyze and get the results, as simple as that. If the readability score is less, then you can make changes in your content and increase it. Readable.io is a very good online text analyzer to check readability of your articles but you can only use it 3 times in a day for free. Just like Textalyzer, it performs a number of tests on the text you submit and shows you results. It organizes the text analysis results in various sections on its interface. It performs Flesch-Kincaid Grade Level, Gunning Fog index, SMOG index, Flesch reading ease, Ogden Basic English, cliché count, sentences > 20 syllables, adverb count, and passive voice count like tests and shows you the result. You can easily analyze your text and make necessary adjustments to make it easily readable to your audience. It gives your text a score based on its readability. You can see your readability rating on the top right side of its web interface. Using Readable.io to analyze text is easy. Just copy-paste text on its interface and see the result. You can see analysis result in various sections. It highlights the sentences where there is a scope of improvement. So, you can optimize the article as it suggests and increases its quality. Finally, when you are done, you can copy the text back and paste it anywhere you like. Also, there are some other very useful tools in it but for them, you will have to upgrade to its premium account. These are some of the best free text analyzer that I have found so far. Using any of these tools, you can increase the readability and quality of your articles in just a few minutes. These websites perform a lot of readability tests on your content and you can easily optimize your articles. Personally, I really like Textalyzer, Hemingway App, and Readability Calculator as some of the best text analyzer in the list. You can tell me yours in the comments.